ABCDchicago: 09-08-07 - MagMahal at Sayat Nova! 09-08-07 - MagMahal at Sayat Nova! 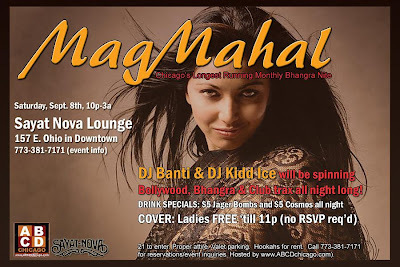 Guests, DJ Banti and DJ Kidd Ice will be spinning 4.5-hours of bangin' Bhangra and Bollywood hits $5 Jager Bombs and $5 Cosmos all nite Hookahs for Rent Call ahead to reserve a table for you and friends. COVER: Ladies FREE till 11p.